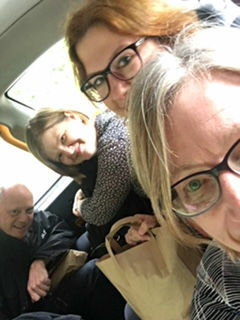 Three of the senior academic staff from the Department had the opportunity to attend the Society for Academic Primary Care meeting in Warwick in the UK in July. The SAPC meeting is a premier primary care research meeting where attendees have the chance to hear about cutting edge primary care research from across Europe. A n important focus of the meeting was on studies exploring innovative solutions to pressing issues facing GP in the UK, where the workforce is under increasing stress as demand increases. There were a number of sessions presenting studies of alternatives to the face to face consultation such as through phone, email or skype consultations. Needless to say there is very tentative evidence that these provide a realistic solution to the problem nor that they are acceptable to both patients and GPs. A more bespoke approach to local solutions seem to work best. Our own A/Prof John Furler delivered an invited distinguished paper presenting the results of the Stepping Up Study which was published in the BMJ earlier this year. Professor Helen Stokes-Lampard is Chair of Council for the Royal College of General Practitioners and she presented a very optimistic keynote address about the “sparkle and joy” of general practice if we can only harness our strengths and make our case for the key role we lay in the health system. Professor Jane Gunn presented on her de-prescribing work with the Mental Health research stream of the Department (photo) and Jo-Anne Manski-Nankervis and John Furler presented on diabetes related studies. Our colleague Domhnall MacAuley from the CMAJ was in attendance and as usual, created some excellent short video blogs featuring conference highlights, including Jane Gunn discussing the idea of scholarship as an important sustaining element of our profession.